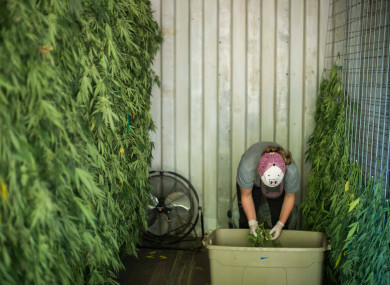 A farmer in California hangs cannabis to be dried in their drying shed. THE IRISH FARMERS’ Association has said it is open to meeting Health Minister Simon Harris to discuss the possibility of farmers growing cannabis for medicinal use. It’s nearly two years since the health minister announced that a medicinal cannabis access programme is to be established, but as of yet no scheme has been rolled out. Harris has acknowledged that the “lack of availability of cannabis products in Ireland remains the most critical barrier to full implementation” of the scheme. In a recent interview on RTE’s Ear to the Ground programme, Harris said he would be open to Irish farmers growing the drug. “This is not about recreational use and people smoking joints. “This is about using in a controlled way, in a monitored way, with the support of your clinician, a product that could ease your pain and suffering after you’ve tried all the conventional treatments. In order to get the scheme up and running, the government is looking to import cannabis to Ireland. “You can’t obviously do that overnight,” said the minister. Currently, department officials are trying to ascertain a supplier for the drug, having made scoping trips to other EU countries such as Denmark to see how it operates such a programme. However, in the long term the minister said Irish farmers should supply the cannabis for the medicinal use scheme. “There is quite a lead-in time and there are patients who need this product as soon as possible. What we’re likely to do in the first course of action is to try and secure a product. “Then in the medium terms talking about growing our own and securing our own supply in Ireland is the sensible thing to do,” he said. Irish farmers are finding it increasingly more difficult to turn a profit on their goods, with farmers taking to protest outside supermarkets such as M&S last week to draw attention to what the IFA called ‘predatory’ pricing models. Tasking Irish farmers with growing the regulated cannabis product could be seen as a very lucrative revenue stream for those that are under financial pressure. An IFA spokesperson told TheJournal.ie that it is always open to discussing such measures. We note the minister’s comments with interest. Farmers always consider the merits of any potential diversification and we are open to meeting with the minister to discuss this matter, should he wish. Email “IFA willing to meet health minister after he backs idea of Irish farmers growing cannabis”. Feedback on “IFA willing to meet health minister after he backs idea of Irish farmers growing cannabis”.